National and international actors will present reflections and recommendations on criminal investigation and prosecution strategies, such as the selection and prioritization of cases, for a better development of the Justice and Peace Process in Colombia. 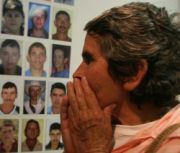 Experts will present relevant experiences and contributions from Germany, Guatemala, Argentina and the International Criminal Tribunal for the former Yugoslavia (ICTY) as a means to improve the prosecution process for demobilized paramilitaries in Colombia. Papers to be presented at the conference include: "Confronting a Long List of Past Atrocities: How to Select and Prioritize Cases of International Crimes," by Maria Paula Saffon, research associate at DeJuSticia; "State of System Crimes Prosecution in Colombia: Prosecution Strategies," by Paul Seils, ICTJ vice president for programs and legal, "Strategy of Selection and Prioritization in Colombia", Andreas Forer, director of ProFis; "Successes and Failures of Prioritization and Selection at the ICTY," Dan Saxon, former ICTY prosecutor, and "Procedural Alternatives for Transitional Justice Processes," by Professor Kai Ambos. If you are interested and cannot attend the conference in Bogota, you can follow it online in English and Spanish. Visit the conference blog at colombia-justicia-priorizacion.ictj.org for background on the conference, to learn about the speakers, and see what topics will be covered. The blog will also feature the discussions held during the conference and will provide a platform for social networking and feedback to the experts and activists in Bogota. 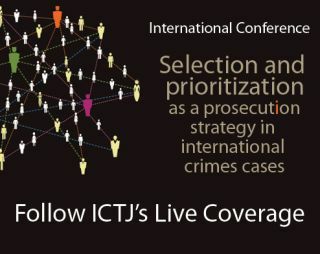 Conference updates will also be posted to ICTJ's Facebook page, www.facebook.com/theICTJ, and you can follow the conference on Twitter with the hashtag #TJbogota (English) or #JTbogota (Spanish). Photo: The paramilitaries accused in the Justice and Peace Process left thousands of victims in Colombia.